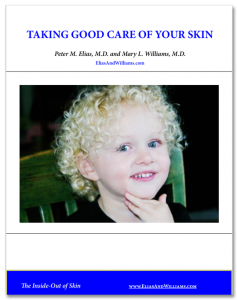 Q&A Archives - Page 3 of 3 - Elias and Williams: The Inside-Out of Skin by dermatologists and skin researchers Peter M. Elias, M.D. and Mary L. Williams, M.D. Q: Do blackheads mean that my face is dirty? Blackheads bear no relationship to your personal hygiene. They result from the oxidation of sebum (the oily material produced by sebaceous glands) and keratinous material (outer skin cells) that fills the dilated pores with exposure to the air. Regular use of a scrub cleanser can help to reduce the size and numbers of blackheads by removing some of the follicular plugs. But more importantly, blackheads are usually an early warning sign of acne. Treatment of acne at this stage – when the pores are plugged and forming blackheads (‘open comedones’) and small flesh-colored bumps (‘closed comedones’) – can prevent the later development of pimples (‘inflammatory papules and pustules’). If you have more than a few blackheads, you probably need to make an appointment with your dermatologist. Q: Will Bathing Dry Out My Skin? If you have patches of dry skin to begin with, how you bathe and how often you do it is likely to make a difference. Too frequent bathing, particularly if accompanied by the use of hot water and a harsh soap, can worsen dry skin. But, bathing two or three times weekly in tepid water, using a mild soap, followed by the application a moisturizing cream or ointment (usually not a lotion) soon afterwards, may not pose a problem for your skin. This will make sense if you consider the frying pan analogy. Skin uses fat (lipids) in its outermost layer, the stratum corneum, to waterproof us – that is, to provide our skin’s permeability barrier. Using this analogy, consider your skin to be similar to a well-greased frying pan. If you wanted to clean that pan of its grease, you would plunge it into hot water and use a generous amount of dish soap or detergent, to scrub off the accumulated grease. Many of us treat our skin as if it were a dirty frying pan. We take showers or baths using water as hot as we can tolerate, then we scrub our skin vigorously with a soapy cloth. This is an effective means to remove dirt and other accumulated debris, but it also extracts some of the natural oils from our stratum corneum. As our stratum corneum becomes deficient in its natural oils or ‘lipids’, it gets even dryer. And so, our dry skin condition can worsen. A gentle skin care routine – cooler water, milder soap, and use of emollients afterwards – is especially important for people with skin conditions like eczema or atopic dermatitis and for the elderly, who are particularly prone to dry skin. For more information on skin care practices, sign up to receive our free booklet: “Taking Good Care of Your Skin”. Fatty acids are a class of lipids (or fats) that consist of a hydrocarbon chain terminating at one end in an acidic, carboxyl group. In the body, they are often bound (‘esterified’) to other molecules to form ‘complex’ lipids, like phospholipids and triglycerides. In the stratum corneum, unbound or ‘free’ fatty acids are one of the 3 key classes of lipids that form the lamellar membranes of the stratum corneum. The other two are cholesterol and ceramides. Ceramides are another type of complex lipid which possess esterified fatty acids. [Read more…] about What Is a Fatty Acid? Ceramides are a family of lipids that consist of two long chain fatty acids linked to one another by an amide group. [Read more…] about What Is a Ceramide?